A supporter of the Secretary General might say something like this: “Article 99 gives the Secretary General sole discretion to decide whether or not a situation he wants to take before the Security Council is a threat to international peace and security, and he doesn’t have to justify his choice in any way.” But that is problematic. It is true that the Secretary General has been given discretion, but no discretion is ever absolute or untrammeled. It is a settled principle of Administrative Law, for instance, that an official who has been given discretion must nevertheless exercise that discretion in a reasonable way. True, the Secretary General is not subject to the Administrative Law of individual nations, but it cannot be that he is immune from principles of administrative conduct generally accepted in much of the world. If nothing else, he has to justify his actions in the court of public opinion. So, asserting a claim to absolute discretion is simply out of the question: at the very least, the Secretary General is going to have to come up with an argument, albeit even a farfetched one, that “accountability issues” in Sri Lanka pose a threat to international peace and security. Let’s suppose that he were to concoct some such argument purely to reach the threshold of reasonable administrative conduct. In that case, it only leads to a further problem, because a critic can point out, “If he is willing to “stretch” with respect to Sri Lanka, why not “stretch” with respect to other places in the world, and bring those also to the attention of the Security Council?” I want to digress a moment at this stage, and briefly mention two of my own favorites for places that I feel could use a little bit more of this sort of special attention. (These examples are not directly related to events in Sri Lanka, but they’re relevant to the overall point I’m trying to make here, plus, they will be relevant to my argument in the next segment, with respect to possible violations of Article 100 and 2(7).) In any event, here are just two of my choices (the reader can substitute his or her own choices in place of mine). The crisis in human rights and governance in Honduras has become apparent to the world and is a fact of daily life within the country. In the two years since Lobo came to power in elections boycotted by the opposition, Honduras catapulted into the top spot in the world for per capita homicides — the United Nations Office on Drugs and Crime’s (UNODC) Global Homicide Survey found an official murder rate of 82 per 100,000 inhabitants in 2010. There were 120 political assassinations in the country in 2010-2011. In the region of Bajo Aguan, where peasants are defending their land from large developers, 42 peasants have been murdered, and alongside 18 journalists, 62 members of the LGBT community, and 72 human rights activists have been killed since 2009. The Honduran Center for Women’s Rights reports that femicides have more than doubled and that more than one woman a day was murdered in 2011….The disturbing suspicion that the U.S. government, the historic godfather of the region, had given its blessing to the new regime became certainty when the State Department negotiated an agreement that paved the way for coup-sponsored elections without assuring the return of the elected government. Rwanda has a president named Paul Kagame who twenty years ago was the head of the Ugandan CIA under President Musuveni and Rwanda and Uganda remain pretty much joined at the hip. Both Musuveni and Kagame are dependent on the hundreds of millions of under the table royalties they are making off the illegal mining they “protect” in north and eastern Congo and both countries have “peacekeepers” funded by the UN in Somalia. So the UN is giving both countries lots of weapons and cash and then doesn’t like it when such ends up supporting local warlords on behalf of the Musuveni/Kagame mafia? And in the meantime millions of Congolese die, millions more live in desperate conditions fleeing the fighting and millions more dollars each day are looted from the Congo, a country that meets the definition of a failed state if ever there was one. Now, I am no expert on either of the above situations, but if even half of what these two writers say is true, the above places cry out for special UN attention. I have a simple question,:When is the Secretary General going to commission Panels of Experts on “accountability,” or reviews of UN “failures,” in these places? To return, I’m interested here only in the larger point: if the Secretary General is to make the argument that his discretion under Article 99 allows him to consider “accountability issues” in Sri Lanka a threat to international peace and security, and to proceed with various reports and inquiries with regard to the matter, he is going to have to explain why he hasn’t used that discretion in the same manner with regard to innumerable other places in the world. And that puts him, not to mention his legal advisors, in a very difficult and uncomfortable position. The long and the short of all this, then, is that recourse to Article 99 is not open to him in this instance. Progress on accountability was slow, but the UN would continue to pursue the issue. 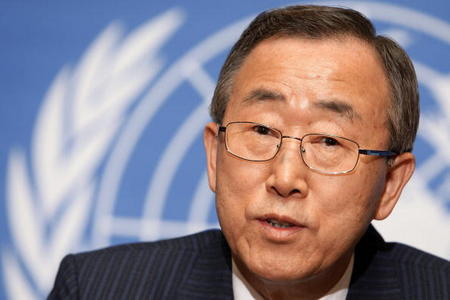 In June 2009 the Policy Committee discussed the possibility of UN action to establish a mechanism for an international investigation, an option presented by OHCHR….The UN Office of Legal Affairs advised the Secretary-General that he had the authority, under Article 99 of the UN Charter, to establish Commissions of Inquiry. In July 2009, the Policy Committee held a meeting exclusively on accountability in Sri Lanka during which the Secretary-General decided to give the Government of Sri Lanka some time to meet its responsibilities on accountability, but to establish an international initiative of some sort if it did not do so. From July 2009 to the beginning of 2010 the Secretary-General and senior UN officials repeatedly urged the Government to take action to ensure accountability. In a 14 September 2009 letter to the President of Sri Lanka, the Secretary-General said he was “considering the appointment of a Commission of Experts to advise me further and to be available to you for assistance” on accountability. In March 2010, in the absence of Government initiative on the issue, the UN informed the Government and Member States of plans to establish a UN Panel of Experts on accountability in Sri Lanka. A number of interesting points emerge from this passage. First, it says that the Secretary General’s legal advisors told him he had the authority under Article 99 to establish Commissions of Inquiry. But did they also tell him that his authority under the Article would cover a Commission of Inquiry on Sri Lanka in this particular instance, with respect to the issue of “accountability”? The passage is surprisingly silent on this crucial question. To pursue this a bit further, the passage indicates that soon after being informed that he had authority under Article 99 to establish Commissions of Inquiry, the Secretary General decided to give “Sri Lanka some time to meet its responsibilities.” That is obviously very generous of him, but why didn’t he resort to a Commission of Inquiry after the requisite time had passed? Instead, he chose to base his actions on the purported agreement with the President, which, as we saw, is quite insufficient for the purpose. Surely, the Secretary General and his legal advisors were also aware of the flimsiness of the agreement with the President as a legal basis. And yet they resorted to it, despite having (according to their own testimony,) the option of a Commission of Inquiry. What does this mean? It means, in my view, that they felt, under the circumstances, that a resort to the agreement with the President, as flimsy as that was, was still better than a recourse to Article 99—which means, by extension, that they felt a recourse to Article 99 was really unavailable in this instance. Second, consider the last sentence in the passage, “In March 2010, in the absence of Government initiative on the issue, the UN informed the Government and Member States of plans to establish a UN Panel of Experts on accountability in Sri Lanka.” This is clearly an untruth if not an obfuscation. As the terms of reference of the first report made absolutely clear, the commissioning of that report, and also the designation of the “Panel of Experts,” was emphatically an act of the Secretary General, not the UN, in the sense that the decision to commission the report and to appoint the experts was not a collective decision made by UN Members. The decision to commission the reports, to repeat, was taken by the Secretary General exercising his discretion. Certainly, Members were welcome to give their input, but the Secretary General had the final say in whether or not he would accept any such input.